Captain Benjamin Hornigold (c. 1680–1719) was an 18th-century English pirate who operated during the tail end of the Golden Age of Piracy. His career lasted from 1715 until 1718, after which he became a pirate hunter and pursued his former allies on behalf of the Governor of the Bahamas. He was killed when his ship was wrecked on a reef during the hurricane season of 1719. Hornigold's early life is unrecorded, although he is sometimes claimed to have been born in the English county of Norfolk, where the surname Hornigold or Hornagold appears. If so, he might have first served at sea aboard ships whose home port was either King's Lynn or Great Yarmouth. His first documented acts of piracy took place in the winter of 1713–1714, when he employed periaguas (sailing canoes) and a sloop to menace merchant vessels off the coast of New Providence and its capital Nassau, where he had established a 'Privateers' or 'Pirates' republic. By 1717, Hornigold had at his command a thirty-gun sloop he named the Ranger, which was probably the most heavily armed ship in the region, and this allowed him to seize other vessels with impunity. Hornigold's second-in-command during this period was Edward Teach, who would later be better known as the pirate Blackbeard. When Hornigold took command of the Ranger, he delegated the captaincy of his earlier sloop to Teach. In the spring of 1717 the two pirate captains seized three merchant ships in quick succession, one carrying 120 barrels of flour bound for Havana, another a Bermudan sloop with a cargo of spirits and the third a Portuguese ship travelling from Madeira with a cargo of white wine. 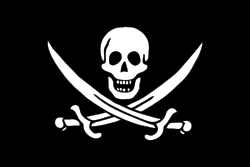 In March 1717 Hornigold attacked an armed merchant vessel sent to the Bahamas by the Governor of South Carolina to hunt for pirates. The merchantman escaped by running itself aground on Cat Cay, and its captain later reported that Hornigold's fleet had increased to five vessels, with a combined crew of around 350 pirates. Hornigold is recorded as having attacked a sloop off the coast of Honduras, but as one of the passengers of the captured vessel recounted, "they did us no further injury than the taking most of our hats from us, having got drunk the night before, as they told us, and toss'd theirs overboard". Despite his apparent maritime supremacy, Hornigold remained careful not to attack British-flagged ships, apparently to maintain the legal defence that he was a privateer operating against England's enemies in the War of the Spanish Succession. This scrupulous approach was not to the liking of his lieutenants, and in November 1717 a vote was taken among the combined crews to attack any vessel they chose. Hornigold opposed the decision and was replaced as captain. At the time, Edward Teach was commanding Hornigold's second ship, and he probably did not learn of the mutiny until the two ships met later in the year. It was most likely that at this time the two pirates went their separate ways, with Teach setting sail for the Caribbean once again, leaving Hornigold to limp back to New Providence in command of a single sloop and a small crew. He continued piracy operations from Nassau until December 1717, when word arrived of a general pardon for pirates offered by the King. Hornigold sailed to Jamaica in January 1718 and received a pardon from the governor there. He later became a pirate hunter for the new governor of the Bahamas, Woodes Rogers. On September 5th 1717, King George the III Issued the Proclamation of 1717 "For Suppressing Pirates in the West Indies." This document granted a pardon to all pirates who surrendered themselves to any colonial governor or governor under the domain of the British Empire save passage and were guaranteed a "clean slate" of their record. However, word of this did not get out to the West Indies and so in December of 1718 another proclamation, or more famously known as the King's Pardon of 1718 was issued for the same purpose. In both of these documents, not only were pirates granted a clean slate on their record, but they were also offered a large sum of money for the capturing of other pirates who were guilty of piracy, murder, and treason against Her Majesty. More specifically, for every captain who was captured, the person responsible would receive 100 pounds, and for every lieutenant and "boatswain" a reward of 40 pounds was offered. Each level of member on a pirate ship had a reward placed on their heads from this point on. Rogers granted Hornigold's request for a pardon, but he commissioned him to hunt down other pirates, including his former lieutenant, Teach (Blackbeard). Hornigold was to spend the next eighteen months cruising the Bahamas in pursuit of Stede Bonnet and Jack Rackham. In December 1718 Governor Rogers wrote to the Board of Trade in London commending Hornigold's efforts to remedy his reputation as a pirate by hunting his former allies. In late 1719, Hornigold's ship was caught in a hurricane somewhere between New Providence and Mexico, and was wrecked on an uncharted reef. The incident is referred to in the contemporary account A General History of the Pyrates by Captain Charles Johnson, which states, "in one of which voyages ... Captain Hornigold, another of the famous pirates, was cast away upon rocks, a great way from land, and perished, but five of his men got into a canoe and were saved." The specific location of the reef remains unknown. Hornigold appears as a non-player character in the 2013 video game Assassin's Creed IV: Black Flag, voiced by Ed Stoppard. He is a supporting character in the Starz series Black Sails, portrayed by Patrick Lyster. Found in Assassins creed: Pirates during story mission; not an accurate portrayal. Earle, Peter (2003). The Pirate Wars. Methuen. ISBN 0-413-75880-X. Konstam, Angus (2006). Blackbeard: America's Most Notorious Pirate. John Wiley & Sons. ISBN 0-471-75885-X. ↑ Woodard, Colin (2007). The Republic of Pirates. Harcourt, Inc. pp. 88–89. ISBN 978-0-15-603462-3. ↑ Woodard, Colin (2007). The Republic of Pirates. Harcourt, Inc. pp. 231–6, 284–86. ISBN 978-0-15-603462-3.